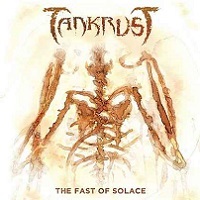 The name sure had us fooled – “Tankrust” is not the timely mash-up of Tankard and classic French rockers Trust, the band best known for providing the original version of “Anti-Social,” a song Anthrax made popular in the late-80s. (Full disclosure: That’s not what we were thinking.) Originally formed in 2006 under the name of Elusis, Tankrust plays a rambling, tough-guy brand of modern thrash, one that is not quite as vitriolic as Hatesphere, but not as meat-headed as it would initially appear. The band’s debut happens to be The Fast of Solace, an album buoyant enough to keep these five Parisians out of the groove/thrash gutter. Vocalist Guillaume Kootoh plays the part of resident barker, pushing around verses and choruses of the mosh-ready type on opener “DMZ” and “Dead Pools,” which is perhaps the most convincing song of the bunch, a headstrong, varied offering of punchy Euro thrash and off-balance groove metal. The aptly-titled “Grow Some Balls” and “Barbarians” function well within the confines of taut, but not-quite over-the-top thrash, with Tankrust not quite there in terms of treading those malicious hooks and sanguine melodic leads – always necessary components when trying to pull this sort of thing off. Nevertheless, The Fast of Solace, and to a greater extent, Tankrust, are a worthy addition to the back-end of the Euro thrash scene, particularly in their home country of France, who haven’t quite produced as many top-flight acts as you’d think.